At Affinity Counseling, we deal with all types of counseling to help people including pre-marital services. Whether you’re looking for guidance in relationship counseling or you want to discuss the big changes you’re about to go through when you get married, our counseling center can be of assistance to you on these next steps of life with your loved one. We are here to service you and ensure you have the best fit for your emotional and mental needs. Pre-marital counseling is a type of service that allows you to prepare yourself for the next step of your relationship. It also helps you get ready for the challenges you may face during your marital relationship. We can help focus on your conflict resolutions, decision making together, problem-solving, and communicating with one another. We’ll go over the key concepts of marriage to help you develop the correct attitudes, knowledge, and expectations of what a marriage entails. Our main goal is to help you create a satisfying relationship with your partner to ensure you have a loving, stable, and healthy marriage. Additionally, pre-marital services will help you identify some weaknesses that may become a problem in your marriage. It’s a good idea to enroll in a pre-marital counseling because it allows you to develop the necessary skills to communicate, set expectations that are realistic, and to have conflict-resolution skills so you can navigate any issues that may arise in your marriage. It will allow you to set a positive attitude of what you can expect from your partner and how to figure out certain issues down the road. Whether you have a huge fight in the first year of your marriage or financial issues come up 20 years down the line, these skills will help you keep in mind your history together, our love for one another, and the values you have. 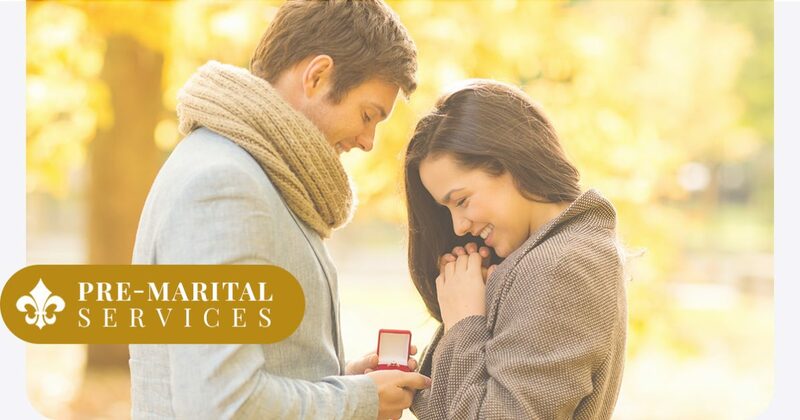 Premarital services aren’t only targeted for people who are religious. It’s for people who want to set a standard for their marriage and learn how to understand and support your partner with skills that will stay with you for the rest of your life. At Affinity Counseling, we’ll prepare and enrich you with relationship counseling. As a counseling center, we have the necessary experience and knowledge to help you grow as a couple. We want to give you the necessary skills to ensure you have a strong, healthy marriage that will last a lifetime. If you’re interested in relationship counseling with your partner, then contact our counseling center. We look forward to guiding you on a lifetime of happiness together.